If you haven't read Charlaine Harris' novels about Midnight, Texas, you really can't start with the third, Night Shift. You have to go back to Midnight Crossroad, the first book, to meet the denizens of the small town with one stoplight. You have to meet them just as Manfred Bernardo, the psychic did. If you don't meet Fiji the witch, her cat Mr. Snuggly, the two men who run the antiques store and nail salon, the Rev and his friends, and the residents of the pawn shop, you won't understand why this small group of people is upset when people come to the crossroads to commit suicide. It's not that Midnight, Texas is isolated. But, the members of this group, the business owners and townspeople, all have secrets that they need to hide from ordinary people. When the sheriff and his deputy, Anna Gomez, show up, no one is going to tell them the complete truth. And, Gomez senses that. "Anna Gomez has never liked Midnight, and its people are all guilty until proven innocent to her, no matter what her boss says. But even Gomez can't hold the Midnighters responsible for this suicide, though she'd love to find a way." The residents are hiding their true selves, and some of the residents are just in hiding. But, someone, or something, has found Midnight. And, it's going to take research, and power, and sacrifice, and the entire community working together to keep the town from final destruction. Night Shift is just as powerful, and even more entertaining, than previous books in this series. Despite the deaths and the uncovered secrets, the fear and the violence, there are moments of humor. The stories are intense, dramatic ones, building to remarkable climaxes. And, the unusual residents truly care for each other and the community they created. 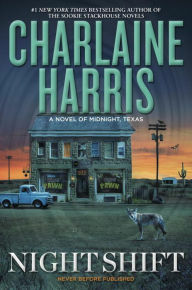 Charlaine Harris combines intricate plots and remarkable characters in a world she has built in Midnight, Texas. This is slightly creepy and world-building at its best. Night Shift by Charlaine Harris. Ace Books (Penguin Random House). 2016. ISBN 9780451488053 (hardcover), 308p. Just started this one last night. I've really enjoyed the series. Me, too, Bill. I think it's terrific. Love the residents of Midnight. I love this series. Probably would never have discovered it without you and Aubrey raving about it. Can't wait to read this one!